I love trade shows: the noise, the excitement, the people—lots of people. Run into me at any trade show and I probably have a huge smile on my face as I move from meeting to meeting across the show floor and through the conference halls. I’ve been in this industry for more than 25 years, and the amusement never wears off. 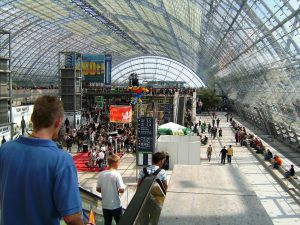 Sure, there can be plenty to hate, too: Trade shows can be tacky, repetitive, expensive, exhausting, and you have limited time to explore the city they’re held in. And the walking. Ugh, the walking. They’re are all about making face-to-face connections with influencers, customers and potential customers. The industries we’re in are as much about building relationships as they are about having the latest, greatest product to show off. Twenty-five years ago, trade shows and print magazines were pretty much all we had to tie our industry together on a regular basis. Today, we spend so much time on email, websites and social media that we forget that there’s a huge benefit to face-to-face meetings with media and analysts, and with partners, customers and potential customers. Whether you’ve scheduled formal meetings at the show, or are planning a series of drop-bys, In-Person meetings are still critical to business. Even if they happen only once or twice a year, these face-to-face meetings are oftentimes what it takes to tell your story and close a sale. They’re a great place to network. Trade shows are the perfect place catch up with past acquaintances, former colleagues and industry friends (new or old). With attendees spending an average of 5 hours on a trade show floor, it’s the perfect place to run into people you know, and people you want to know. It’s like a Live, In-Person version of LinkedIn. Regardless of the size of the show, I always manage to run into a dozen people that I haven’t seen in a few years. It’s possible they’re up to something new, and it’s fun trying to determine how we can help each other. They can help close a sale. Certain trade shows are known for being deal-making shows, and those are my favorites. While the paperwork may or may not get signed there, there are plenty of multimillion-dollar handshake deals happening in conference rooms. I literally learn something new every day. “Content is king.” While conference sessions may be starting to be a little repetitive from show to show, the Programming is really what makes the event good or bad. The organizers should know this. The show floor may be weak, but if the Programming is great, it’s still a worthwhile event. It’s a rare trade show that I don’t learn something new about our dynamic industry. I love drinking in all this knowledge, all in one place. They’ve stood the test of time. In an age when people don’t need to leave their desk or couch anymore, trade shows are still going strong. The industry predicted years ago that trade shows would be rendered obsolete. Instead, most have moved with the times, embracing technology instead of fighting it. My favorite part: On the last day of the show, I always pull off my show heels and make my final rounds in a pair of flats or—yes—even flip-flops. It’s a great conversation starter and my little reward for another successful show on behalf of my company and its clients. Feel free to contact me if you’d like to know more about my philosophy of why niche shows are winning, or any other questions you may have. Interested in learning more about how we can help you rev up your trade show strategy and other parts of your marketing communications programs? Meet with Calysto at CES! Contact Marissa Evans at mevans@calysto.com.